This book shows that you don't need a large kitchen, expensive ingredients and fancy equipment to produce good food. Faith Hancock worked as a nanny in France before travelling to Thailand, where she learned to cook Thai style. 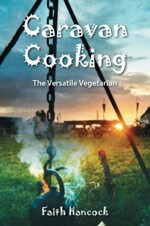 On her return she lived in an old VW camper van, which taught her to cook in small spaces! After a year spent in Australia she decided to make writing her career, and to combine her two greatest loves – good food and good writing. She is currently studying for a degree in English Literature with the Open University, and was placed first in a short story competition in 2012. She has also written an ebook which is available on www.moneysavingplanetsaving.co.uk. She has lived in a caravan for 5 years now, and is learning daily about new recipes and the best way to cook and store food in a smaller than average kitchen. NB: the iBook is available more than 50 iBookstores around the world. We don't have room for links to all of them but clicking on one of these should eventually lead you to the right one!